Being a style enthusiast can be expensive! Suits, shoes, pants, accessories, sheesh who can keep up with all that, especially if you're just starting out? Well, there may be a solution for the guy who wants to improve his style but doesn't want to spend an arm and a leg and a tooth. About 3 months ago Target started carrying a clothing brand called Goodfellow and Co that is geared towards the budget conscious man. As great as that may sound to our wallets I have to be honest about the quality. There is a reason why certain brands charge quite a bit for their products, they use high quality materials to make them. With low prices and polyester blend products, it isn't the best quality but not to discourage you, there are still some nice pieces that they have especially to muscular guys. Hell, I bought some pieces I don't intend on returning so it ain't all bad, just wanted to give you guys a heads up. With that being said, let's get on with the pieces I bought and if they are a fit for the Fit Man. What Does Goodfellow & Co Offer? Everything. Sport coats. Dress Pants. 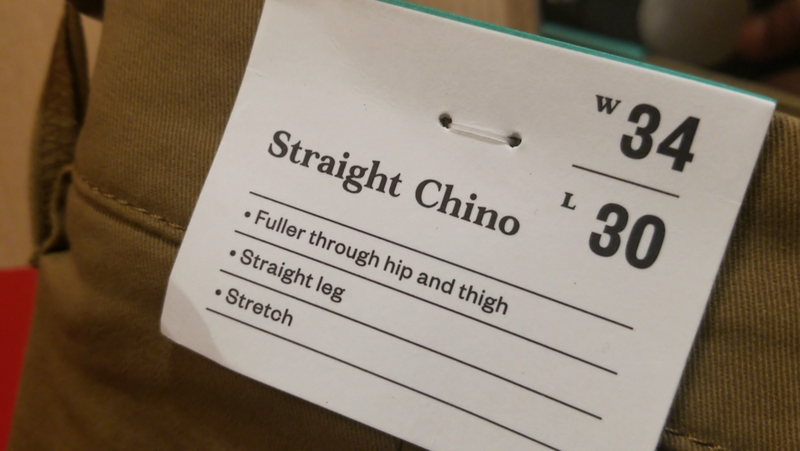 Chinos. Jeans. Dress shirts. Casual Shirts. Hats. Socks. Underwear. EVERYTHING! They are really trying to reach every style option for men which is common for these mass produced brands. From chilling in the crib to casual night out to smart casual work attire, they pretty much got you covered. Let's get into what I got, the materials used and how they fit. Seven items totaling $160. What I had in mind was casual and versatility. 2 Long sleeve baseball shirts - I'll be honest, I got these based on how my arms looked in the contrasted sleeves, welcome to the gun show. Made from 100% cotton, these shirts fit true to size (I'm a large) and are a great addition to my casual wardrobe. 2 Turtleneck Sweaters - Living in New England, I need something other than scarfs to protect my neck. I've been gravitating towards turtlenecks lately and to my surprise, Goodfellow carries them. I know alot of guys don't care much for it but these turtlenecks are super comfy and they fit true to size................until you wash them. Yep, shrinkage happened after a quick laundry spin but not so much that it looked like I shopped at the little kids department. I would wear them again but I'm unfortunately predicting if I keep washing them, they will only last for this season. 2 Chinos - I beelined straight to the athletic fit chino but much to my disappointment they were a little too snug for my liking. Bummer. I haven't had much lucky with straight chinos in the past but what the heck, I gave it a shot and surprisingly it fit exactly how I wanted. Made with 98% cotton and 2% spandex, these straight chinos give me the mobility I need around my quads without feeling too baggy down the leg. Of all the pieces I got, this was my favorite. 1 Cardigan - My cardigan game is non existent so I pounced on these when I saw them. They have the option of light weight and heavy weight so I went for the latter for those days I don't feel like wearing a jacket. Made with cotton and nylon, I'm not sure how it will hold up in the laundry but time will tell. So is Goodfellow a good fit for fit men? Yea it's aite. nothing to go crazy for but they do have a few garments that cater to us athletic men. Very disappointed with the shrinkage making me a little apprehensive to put the other stuff in the laundry but it shouldn't have come as a surprise though. When you shop at department store like Target, Macy's and JCPenney, who can't expect the highest quality of clothing that will last you for years. They ,may just last for a season, making you go back again the following year to purchase more. Good for their bottom line, bad for your pockets. If you're looking for an investment piece that will last you a while, I wouldn't recommend Goodfellow but if you are that style conscious guy looking to start out without spending a grip and using Goodfellow as a spring board to the next thing, then go for it. To start a new rating system, I give Goodfellow & Co 2.5 double monks straps out of 5.